There’s never been a better time for adults to participate in the sport of flag football like 2019. Flag football’s popularity is at an all-time high and that increased interest in the game has spurred growth and innovation in the offerings on the market for men’s and co-ed flag football equipment that can be used by players who are looking to organize pickup games, form a competitive team or a start a league. You could pick up your flags, belts and field cones individually, or to keep it simple, bundle everything you need in the best flag football set for adults (and save some money while you’re at it). 2019 Buying Flag Football Sets and Kits Guide: Grab a Belt, Some Cones and Let’s Play! Different Types of Flag Football Sets and Kits: Pull or Pop? Do You Need Your Set to Have Complete Accessories or Bulk Flags Only? Would You Wear a Duct Tape Flag Football Belt? Flag-a-Tag Sonic Boom Flag Belt, Set of 12 Review: Flag-a-Tags Sonic Boom belt is next level. Sonic belts release an audible “pop” to signal the play is dead. The belts and flags are one solid color. However, there are plenty of colors to choose from. 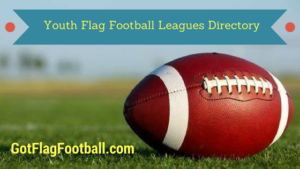 The Flag-a-Tag system is one of the two most popular flag football flags available and are commonly used in organized flag football leagues as well as pickup games. This set includes belts by the dozen so it is easy to facilitate large pickup games, competitive leagues, intramurals or tournaments. Flag-a-Tag will have your team looking like one in a single purchase. Extra storage rings are also available to keep the Flag-a-Tag Sonic Boom well organized. When the game is over, players can hang the flag sets back in the proper place. All in all, Flag-a-Tag offers one of the best flag football kits for adults. SKLZ 10-Man Flag Football Deluxe Set with Flags and Cones Review: The SKLZ 10-man flag football deluxe set is a popular model for adults. The gear comprises of 10 flag football belts. Five yellow belts also come with 10 yellow velcro attached flags. The other team has five blue belts with accompanying velcro flags. Each flag will be attached to the hip of each player. The flag football set also comes with 4 goal line cones as pylons and a bag to store the items. 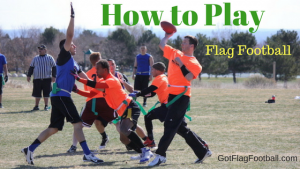 If you are new to the game of flag football, this set also presents a set of rules to learn the game on the fly. However, if you’re a more experienced player, this gear works at all levels. It’s durable material and the detachable nylon flags are designed for hours of use. In fact, the gear was made with physical play in mind. SKLZ has a 100 percent money back guarantee and the price is very reasonable. Star Active Sports Flag Football Deluxe Gear Set Review: This flag football set comes with 20 premium Velcro flags and adjustable belts. The Star Active Sports belts can fit up to 52 inches. The sure grip Velcro flags are red and yellow with a white belt. Due to its size, the four bright orange cones are more visible than other products. They are better suited to stay in position during games. The flag football set comes with a bright orange bag to keep the gear organized. Star Active Sports includes a 5-on-5 playbook (eBook). Flag Football Kit for Adults by Royalton Review – Most Complete Flag Football Set: This is billed as the most complete flag football set around. The Royalton flag set includes 10 high-quality nylon belts. The belts also adjust for the size of each player. In addition, 30 flags come in red and green or blue and yellow. Overall, the durable material is made of water resistant nylon. The bonus item includes a carrying bag and a guide to help players/coaches master the art of flag football. Curious About Fitness Review – Most Complete Flag Football Kit: The Curious About Fitness flag football set is highlighted by six large yellow cones. Their equipment is designed to withstand the rigors of inclement weather. This heavy duty all-weather set is built to last during sun, rain or snow. The 48-inch adjustable black belts are accompanied by three sturdy yellow or red flags per person. The set also comes with two bags. The first is a sturdy carry case. The see-through bag can fit all of the necessary equipment for practices and games. Players can throw flags, cones, and even an extra football in the case. They also add a bonus bag for extra equipment like a kicking tee, playbooks, and even drinks if needed. This product adds another element to your flag football experience. There is a bonus referee kit with a high visibility vest and whistle. With the price remaining affordable, the Curious About Fitness flag set is one of the best sets for adults on the market. WYZworks 12 Player 3 Flag Football Kit Set – 12 Belts with 36 Flags + BONUS 6 Cones + Travel Bag Review: The WYZworks 12-player is one of the most durable and best flag football sets for adults around. The durable nylon belt uses the D-ring closure. Although the belt only comes in white, the flags can be purchased in several colors. The WYZworks kit comes with six marker cones. The four orange and two yellow cones create the field of play. This product also features a bonus bag for captains or organizers to keep the gear in one place. WYZworks 36 Flags & 12 Belts – Velcro Flag Football Set – 18 Red Flags & 18 Green Flags Review – Best Velcro Flag Football Flags and Belts: This set is more for friends and family. The 12-player flag football set by WYZworks only comes with 3 detachable heavy duty flags per belt. Meaning, the set contain 36 flags. The one size fits all belt works well for all ages. They are suitable for league games as well as recreational play. Unfortunately, this flag football set is incomplete if you’re trying to play a full game. For example, this flag football set does not provide cones to mark the field. Therefore, you’ll need to make multiple purchases if you expect to host a game. Still, the gear will get the job done as long as there is a football handy. The best-bet is to use this kit for recreational purposes. 14 Player Flag Football Set with 3 Flags per Belt – Includes 12 Field Cones and Mesh Bag – Premium 68 Piece Heavy Duty Kit Review: The Stumptown Sportz 14-player flag set is perfect for 7-on-7 practice or games. They utilize three heavy duty flags per person and a durable belt. The 3-detachable flags come in red and blue to contrast the white belt. Furthermore, the gear can be stored in a mesh Carrying Bag. The best aspect of the Stumptown Sports flag football set is their ability to mark the field. The set is complete with 12 full size disc cones to line the field and endzone. These cones are a must for competitive games. The only setback is that players may lose vision of the cones in tall grass. The price point is affordable for all of the items you get, which makes it one of the best flag football sets. Trained Flag Football 10 Man Set with Carry Bag, Flag Football Playbook (eBook) and Accessories (46 Pieces) Review: Trained presents simple and easy-to-use flag football gear to the field. The Trained nylon flags and belts are less likely to rip during physical play. They’re joined by velcro and therefore, the flags are more likely to stay on the belt while running. In addition, this Trained gear is equipped to handle two full teams of 5v5. The 46-piece set comes with belts that have three flags each. The flags can be used by any player, whether they are adults or kids. They’re adjustable and adapt quite nicely from the practice field to the game field. It is up for debate, however, whether or not velcro flags work well in competitive games. It is much more rare to find a competitive flag football for adults that even allows velcro flags. Most leagues and players prefer to use the flags that either “pop” or “pull” off completely. Velcro is better for recreational games. This kit also provides a carry bag, four goal line pylons and a flag football playbook. A bonus Ebook provides players with a game plan and directions in case you’re a beginner. For some, the only drawback is that the flag set does not come with a football. However, that is great. It’s better that footballs are sold separately. Players should not be tied into playing with a football they don’t want. Flag-a-Tag: The Flag-a-Tag brand focuses on the flag and belt. In addition to the sonic boom product, Flag-a-Tag introduces complementary pieces to flag football. Players can purchase extra flags in sets of six. They also sell the Flag-a-Tag program kit.The set includes 24 belts with two storage rings. They also provide one flag football rulebook. For those into fashion, the Flag-a-Tag sets come in an assortment of colors capture the eye. Players can also purchase the sonic conversion package for a different set of rules. SKLZ: SKLZ has a pair of options to choose from. The 10-man flag football deluxe set is one of the best in the game. In addition to the affordable prices, the gear makes it easy to set up a recreational game in minutes. With enough flags and cones to set up the field, SKLZ goes well in any game. Star Active Sports: This deluxe set comes fully loaded. Between belts, flags, cones and bags, the Stars brand brings all of the requisite tools to the game. They also provide a colorful bag to place the gear in a safe location. Overall, the brand does not have too many products to select from. However, their flag football set is right on the money for flag football players. WYZworks: The WYZworks brand has numerous products to choose from. All of their flag sets come with 36 flags and 12 belts. Their best set comes with the six bonus cones and travel bag. Otherwise, WYZworkds main attraction is a colorful array of belts and flags. The 12-player set by WYZworks only comes with 3 detachable heavy duty flags per belt. Meaning, the set contain 36 flags. The one size fits all belt works well for all ages. They are suitable for youth league games as well as recreational play. Unfortunately, this flag football set is incomplete if you’re trying to play a full game. That’s why it’s best to go with the bonus package. Due to plenty of leagues playing 5v5 non-contact, 8v8 contact or 9v9 formats, individual players, recreational programs and organized leagues, need the right equipment suited to their flag football endeavors. If a league is playing 5-man, groups can consist of 5-10 players per team. Meanwhile, 8-man football can have between 8-24 players. Therefore, a 10-player flag football set is usually perfect for each 5-man team. Most flag football leagues provide the equipment for their respective teams. However, certain leagues may charge a per game fee to use their gear or require teams to bring their own. Therefore, captains should be prepared to invest in one of the best flag football sets for adult players that they can find. Keep in mind, your league rules should guide what flag football sets or kits that would fit your needs. Fit and durability: is it truly meant for men’s and co-ed leagues or better suited for “child’s play”? There is definitely a difference in the fit of a flag belt, not only along the waistline, but in it’s ability to get heavy usage and often sitting in a giant gym bag, crumpled up until the next game. Cost: The main point of buying the best flag football set for adults, be it 5v5 or 6v6, etc, is to save money, right? You could buy all these items separately: flags, flag belt, cones, pylons and more. But like a WR on a go route with a QB tossing a dime and into the end zone, this is a much easier way to hit metaphorical pay dirt. When it comes to flag football, two things are important: first, you want the flags to remain on the belt while the play is in progress. Second, you want the flag to easily come off when the defender snatches the flag. Within these parameters, the ‘pull’ or ‘pop’ flag is the biggest difference. Flag football uses multiple types of flags for competitive play. The first flag football set that players use are the pull flags. These sets are highlighted by the stitched flag system, such as Triple Threat, as well as the Velcro system with the nylon belts. Most flag football sets come with belts that have three flags per. However, others belts feature only two flags. The other flag is the pop flags, popularized by Flag-a-Tag. The pop flag produces the sonic boom sound to signal that a player is down. The pop flag also works well during big, loud events. Currently, it’s a unique innovative style of belt on the flag football market. Complete with accessories: A full kit is equipped with the allotted number of flags and belts to field a team. The flag football kit also has enough cones and markers to create a legal playing field. The best kits come with carry bags to put the gear in one place. Every pickup group needs an equipment bag! Bulk flags and belts: When buying flags in bulk it’s important to make the correct decision. For example, a 5-man flag football league means teams need at least 10 belts for a full squad. However, 8-man football may have over 20 players per team. In addition, you always need to account for ripped or damaged gear. Therefore, organizers or team captains should be prepared to purchase backup equipment. In conclusion, there are plenty of flag football sets suitable to start a game anywhere, anytime. We have included the best flag football gear from multiple companies. The list includes flag sets for 5on5, 6vs6, 7on7 and 8vs8 football games. Flag football players can also choose flag colors to compliment their jerseys in many instances. Although all sets come with the standard belts and flags, some product gear goes above and beyond to impress satisfied customers. Bright cones to create the football field are a must for league games. You can even find a flag set with referee gear. 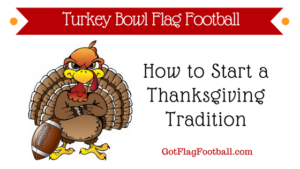 Therefore, players are one step closer to hosting their own family fun game, say a Turkey Bowl game on Thanksgiving, all the way to the most competitive league or tournament.